Lighthouses evoke feelings of mystery, romanticism and sadness. 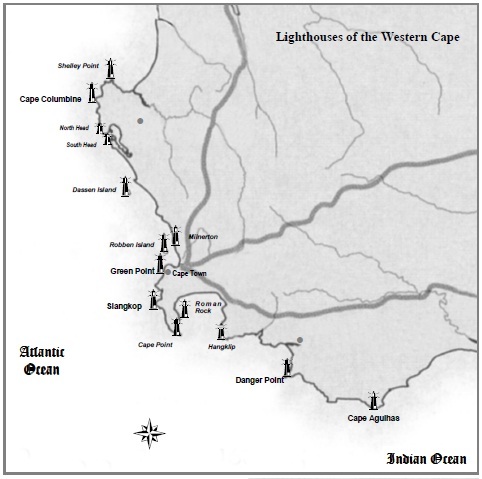 Cape Whale Coast has no less than four lighthouses which put this small stretch of coast in the eye of the Cape of storms. Two of these lighthouses area accessible to visitors. Commissioned on 25 November 1960 the twenty-two metre tower is of reinforces concrete and takes the form of a hollow cylinder. The main tower was built by means of the moving form shuttering principle. The tower was completed in six days. The light flashes one flash every ten seconds, a range of 25 sea miles. Leopard spoor are often seen in the vicinity of the lighthouse. 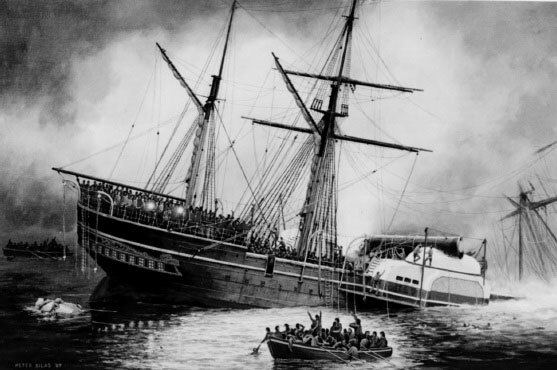 More than four decades before Danger Point lighthouse was commissioned the British troopship Birkenhead was wrecked on an chartered reef approximately one and a half kilometers from Danger Point at two o’clock in the morning on 26 February 1852. 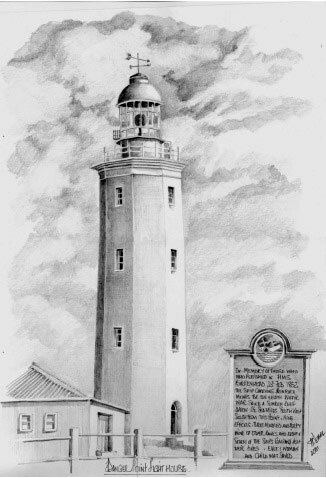 In spite of the loss of lives, property and Birkenhead, and in spite of numerous other wrecks in this area, it took almost forty years for the authorities to promote the erection of a lighthouse at Danger Point. Engineering consultant W T Douglass submitted a re-evaluation on Danger Point in May 1892. During the 1890’s it had become popular to install iron towers, such as the Dassen Island tower. These towers were manufactured by Chance Bros. in Birmingham, were transported in sections and erected under supervision of a Chance Bros. technician. Such a tower was initially planned for Danger Point. But another proposal from Mr Douglass outlined a tower with windows with views to efficiently protect the outlying shoals such as Birkenhead Rock and Dyer’s Island. A Cape Town contractor won the tender for the entire building lighthouse apart from the iron-work. Danger Point, as Dassen Island, suffered delay after delay as Chance Bros. habitually failed to meet deadlines. At long last the maritime community was notified that the light would be commissioned on the evening of 1 January 1895. New Year’s day 1895 was long remembered by the inhabitants of the district- the lighthouse was actually completed and ready to be exhibited. The event created no small excitement and eighteen wagons, carts and any other form of transport crammed full of leading residents pitched up for the ceremony. The brilliant light that was switched on by Miss Lawrence would safely guide seafarers in times to come past the treacherous Birkenhead Rock. 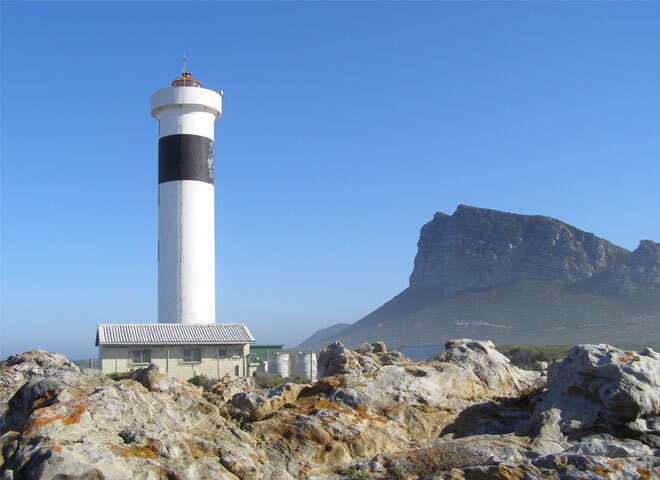 In the earlier days of Danger Point, situated only little over an hours’ drive from the wealthy seaside town, Hermanus, the lighthouse was regarded as an unpopular station by the staff. Bad weather and transport problems were probably the reasons for the dislike. The road to Hermanus was a gravel road, seldom in good condition. They had to travel with a delivery vehicle to Hermanus, by bus to Botriver station and then by train to Cape Town. This was limit to once a year on annual leave. Weekends off had to be spend in or close to the lighthouse. Today the lighthouse welcomes visitors. A plague commemorating the Birkenhead marks the site of the Birkenhead Rock which caused the fateful stranding in 1852. 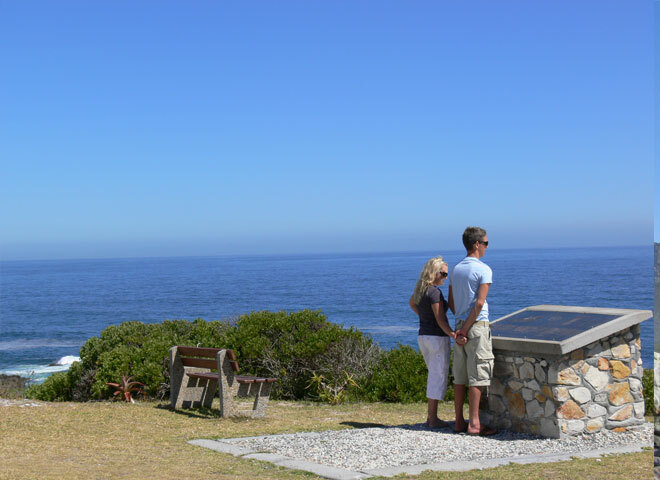 Cape Agulhas, the most southerly point on the African continent was given its name by the Portuguese explorer and navigator, Bartholomeu Diaz, as he rounded the cape for the first time in 1488. At Cabo L’ Agulhas Diaz and subsequent explorer discovered that their compass needles swung in various directions. Diaz found that at the Cape of Needles magnetic and true north coincided (i.e. no magnetic declination). 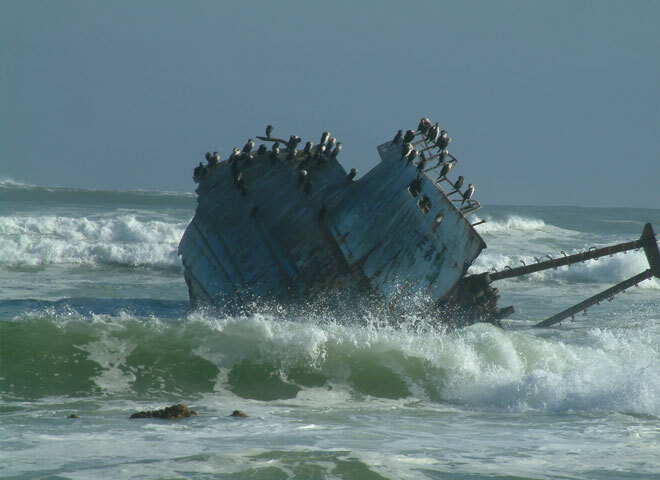 The coastline around the coast from Cape Town is treacherous and fringed with dangerous reefs on which more ships have been wrecked that in any other part of the South African coastline. 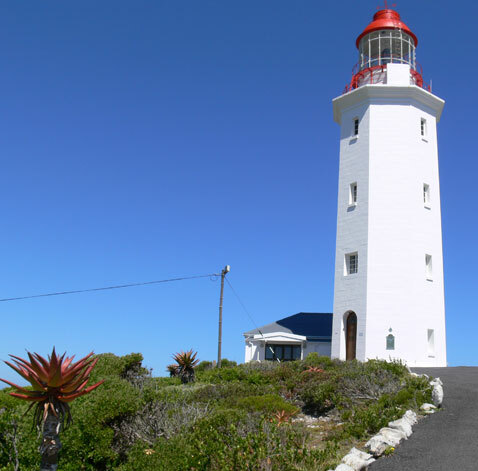 The necessity for a navigational light at this cape was absolutely essential and was given consideration by Colonel Mitchell, that time surveyor –general at the Cape in 1837. 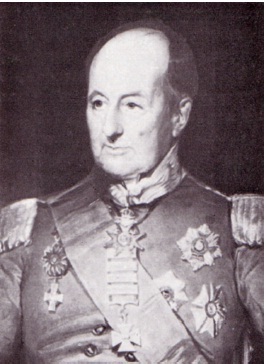 It was brought under the attention of Governor Sir Benjamin Franklin who after immediate inspection of the site requested an estimate for the construction of the lighthouse. Michel Van Breda owned the ground and was willing to contribute by giving in perpetuity as much ground as was needed for the lighthouse. However, the proposed lighthouse met with much opposition and tempers flamed high on various public meeting. The feeling was that the captains of the vessels ought to be well acquainted with their duty and too vigilant to need a light. At long last progress could be reported. 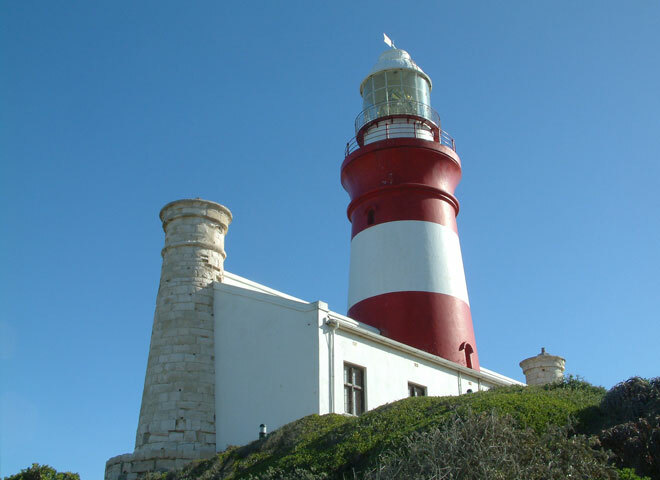 The total cost for the building the two lights, at L’ Agulhas and Recife, was estimated at £25 000 of which the Legislature would forward half and a further £ 1 600 was received from private subscription. It is uncertain when work on the lighthouse commenced but an official notice issued on 15 December 1848 indicated that the lighthouse had recently been completed and that the light would be lit on 1 March 1849. The initial equipment remained in use until late January 1905 when a new incandescent burner was installed. In February 1906 the burners were altered to consume white rose oil. In 1910 the new optical apparatus was installed. A very difficult task as all the casting and glass panels were heavy and awkward. Various other enhancements over the years have been installed. In 1962 the tower was deemed to be unsafe because of seriously decomposing limestone. A new lighthouse comprising a twelve meter aluminium tower was commissioned in 1968. The new light produces a white flash every five seconds and has a range of thirty sea miles. 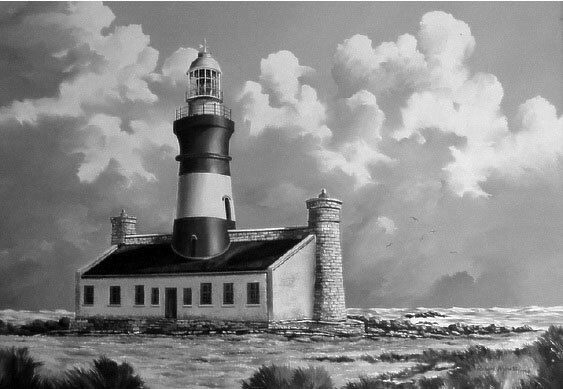 The original lighthouse which was declared a national monument was re-commissioned on 25 March 1988 after being restored. Today the lighthouse building also serves as a museum. Previous Previous post: The Argonaut or the Paper Nautilus.